Medica 2012 will see Rigel Medical showcasing its range of advanced medical device performance analysers, electrical safety analysers and vital signs simulators on stand 11C12. 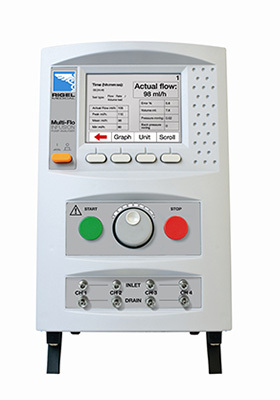 Leading the way will be the Multi-Flo infusion pump analyser, which meets all the IEC 60601-2-24 requirements and can be used for high and low flow, occlusion, back pressure and bolus measurement and features variants of one, two and four independent channels. Also showing will be the new Rigel Uni-Therm high current electrosurgical analyser which is able to test accurately all modern low, medium and high current electrosurgical generators. With a new ultra-low inductance, high resolution load bank, the Uni-Therm can accurately detail the power in response to varying loads. Automatic control of the CUT/COAG allows automatic testing and improves safety whilst reducing test times. The compact Uni-Pulse defibrillator analyser will be showcasing advanced measurement technology to verify the correct operation and functionality of all defibrillators. The battery powered analyser offers both manual and automatic test programs for testing of all mono-phasic, bi-phasic and pulsed waveform defibrillators. All captured waveforms are displayed in colour on the Uni-Pulse’ large colour display. Rigel performance analysers incorporate the latest state-of-the-art electronics and developments in electrosurgical device testing while the range of electrical safety analysers feature the first dedicated IEC 62353 safety analyser - the Rigel 62353 - offering automatic sequencing, onboard data storage and data entry in a lightweight, easy-to-carry enclosure. Rigel vital signs simulators include the UNI-SIM, which is capable of undertaking six synchronised vital signs parameter tests simultaneously: NIBP, SpO2, ECG, temperature, IBP and respiration functionality tests. The move comes as the company continues to benefit from strong growth in important markets in Western Europe, North America, the Middle East and Far East, where there’s demands for high performance testers with advanced added value capabilities. Market leaders in precision optics and engineering technology, Carl Zeiss Ltd, and operating room table manufacturers TRUMPF Medical Systems Ltd are among Rigel customers. It also supplies Hitachi Healthcare, Siemens Medical Solutions and Maquet, one of the world’s leading suppliers of equipment for operating theatres and intensive care units. Visit the infusion pump analyser product page for more information.